Although it has been nearly a year since Pauline Oliveros unexpectedly passed away, I am still at a loss to comprehend the world without her in it. Of all the teachers, role models, colleagues and collaborators I have engaged with as a musician, none has had a greater influence than Pauline Oliveros. Her brilliance, generosity, wisdom and humanity touched a great many people, and I know I am in good company when I say that Pauline Oliveros was the most important mentor of my life. This piece is intended to both capture my memories of Pauline before they fade, and to honor her legacy. I first became aware of Pauline and her music in the early 1980s through her recordings Accordion & Voice and The Well and the Gentle which my older brother owned. Later in the 80s I discovered her book Software for People in the Martin Luther King Jr. Memorial Library in Washington, DC which I studied alongside such books as John Cage’s Silence, R. Murray Shaefer’s The Tuning of The World. Also at that time I became a regular reader Ear Magazine and Musicworks Magazine that often featured stories and reviews involving Pauline, and so it was that she became an important figure in my growing awareness of contemporary experimental music. I first met her in June of 1992, at the Rose Mountain Retreat Center in Las Vegas, New Mexico, the site of a five-day Deep Listening Retreat led by Pauline and Heloise Gold. At that time I was a BFA student at CalArts, and having discovered an advertisement for the retreat in Musicworks, decided to join during my summer break. Situated in a virtual wilderness area in the Sangre De Cristo mountains high above the nearest town, the retreat followed a strict and rigorous schedule, and participants were required to spend much of each day in silence. Activities included breathing exercises, movement meditation, silent walks, tai chi, card readings, Deep Listening Council, and extensive Deep Listening Training. Much of the training involved Pauline leading the group in many of her Deep Listening Meditations, each with a set of written instructions, which we, as a group pursued in various settings in and around the retreat center. This was quite a first encounter with Pauline, and the retreat as a whole was a transformative experience, the echoes of which still resonate for me today. I had relatively little contact with Pauline over the next few years as I completed my studies at CalArts. I do recall listening to her music regularly however, most often the recording Troglodytes’s Delight and other recordings by the Deep Listening Band which I was becoming increasingly enamored of. It wasn’t until January of 1996 that I again encountered her in person. Having completed my studies at CalArts, I eventually found my way to the music program at Mills College, ostensibly to study with Alvin Curran, who until that time was the holder of the Darius Milhaud Chair in Composition. As it would happen, my arrival in mid-year coincided with the announcement that Alvin and Pauline would be sharing the chair beginning in Fall 1996. Thus, the four semesters I spent earning my MA were spent alternately as a student of Alvin and Pauline, both of whom were marvelous teachers. In addition to weekly private lessons, I attended Pauline’s weekly composition seminar, getting a much broader sense of her music and vision. Our private lessons were especially productive for me, and I remember several important episodes that had a major impact on my musical practice. In the first, while a student at Mills I was a member of the open and malleable Mills Contemporary Performance Ensemble, a project of the music department that combined students with faculty and community members in realizing a variety of experimental, open form scores. Ensemble members often brought original scores in this style to try out, and for several weeks I developed a piece of my own. Combining traditional notation with written instructions, my first versions, when brought to the ensemble, failed to bring about the music and sounds that I was after. Finally, I brought my latest draft to my lesson with Pauline, and bringing her vast experience with text-based scores to bear, gave me some invaluable insight on how to integrate the notes with the verbal instructions. Her advice had mostly to do with language – how to ask the right questions, and something immediately clicked. At the following meeting of the Contemporary Performance Ensemble, I distributed my latest revision which took to heart Pauline’s suggestions, and much to my amazement, my piece came alive! I remember emailing her (I was then using my first ever email address) the news of my “breakthrough” and receiving a warm congratulations in return. Another important episode also involved the Contemporary Performance Ensemble. Though I can’t recall the complete sequence of events, the outcome was my becoming a hammer dulcimer player. Though I had owned a dulcimer for many years, my relationship to it had remained limited and private. Through Pauline’s encouragement, her example as an accordionist in experimental music, and the broader experimental musical instrument culture in the Bay Area, I decided to bring my dulcimer to the ensemble as my primary instrument. This began what has become a long term relationship between me and the hammer dulcimer, and an essential part of my musical identity. 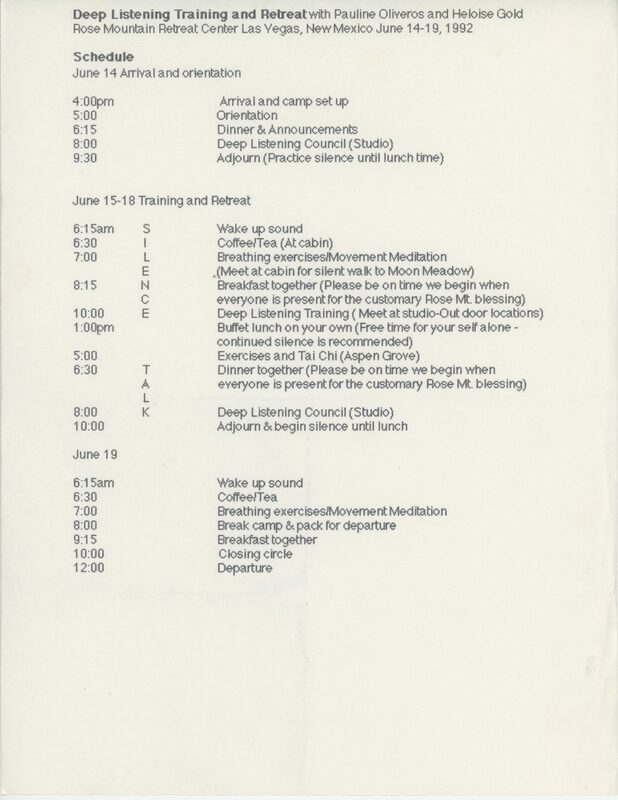 Another significant episode was a week long residency of the Deep Listening Band at Mills College in 1997. I was already well-versed in their recordings to that point, most of which were made in purely acoustic environments, such as the Fort Worden cistern. But this residency revolved around the Expanded Instrument System (EIS) which the Band had developed to simulate in live performances the extreme reverb of their original recording sites. For the better part of the week, the Band – Pauline, Stuart Dempster and David Gamper – held court in a large room within the music building with the EIS fully setup, holding demonstrations, talks, and offering students the opportunity to try it out themselves. During that week I had an opportunity to explore and conceptualize my own newly discovered hammer dulcimer in an electronically expanded way. Thus, my current work with the electroacoustic hammer dulcimer is directly rooted in this encounter with the Deep Listening Band. I left Mills in 1997 and remained in the Bay Area until I moved to New York in early 2001. Throughout those years I remained in close contact with Pauline. In addition to her teaching at Mills, she was very active in the wider Bay Area community with a variety of projects, such as the Circle Trio with India Cooke and and Karolyn van Putten, and The Space Between with Dana Reason and Philip Gelb and I often attended performances by these and other groups she formed. She also organized a number of music/performance works, bringing together different artists from her wider circle. 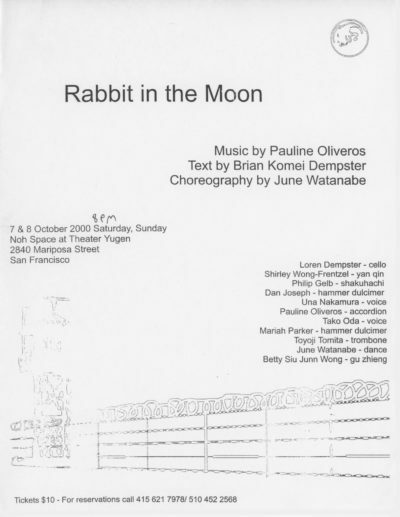 She invited me to participate in one such event, The Rabbit in the Moon which saw two performances at Theater Yugen and a related event at the Meridian Gallery, both in San Francisco. The piece combined the poetry of Brian Komei Dempster, choreography by June Watanabe, and music by Pauline. I was among a cast of eleven performers that included Pauline and June, with Loren Dempster, Philip Gelb, Una Nakamura, Tako Oda, Mariah Parker, Toyoji Tomita, and the legendary Wong sisters, Shirley and Betty. Meeting the Wongs was another key event that Pauline engineered. Betty and Shirley, twin sisters born and raised in San Francisco’s Chinatown, were students of Pauline’s many years earlier at UCSD, and were themselves well known figures in the Bay Area music community, performing widely as chamber musicians, and leading the Chinese and near eastern folk music groups, The Flowing Stream and Phoenix Spring Ensembles. When I began to take up the hammer dulcimer seriously, Pauline introduced me first to Shirley who was a teacher of the instrument, from a Chinese perspective. I spent over a year studying traditional Chinese and Asian folk songs and gradually became involved with the two ensembles, which were co-led with Betty. I also later came to teach at the Community Music Center of San Francisco where they both continue to be long time faculty members. Becoming part of their lives and community was another great chapter that originated with Pauline. During those Bay Area years I also became better acquainted with the wider community of Deep Listeners, those who had studied the practice of Deep Listening through retreats, courses and workshops. 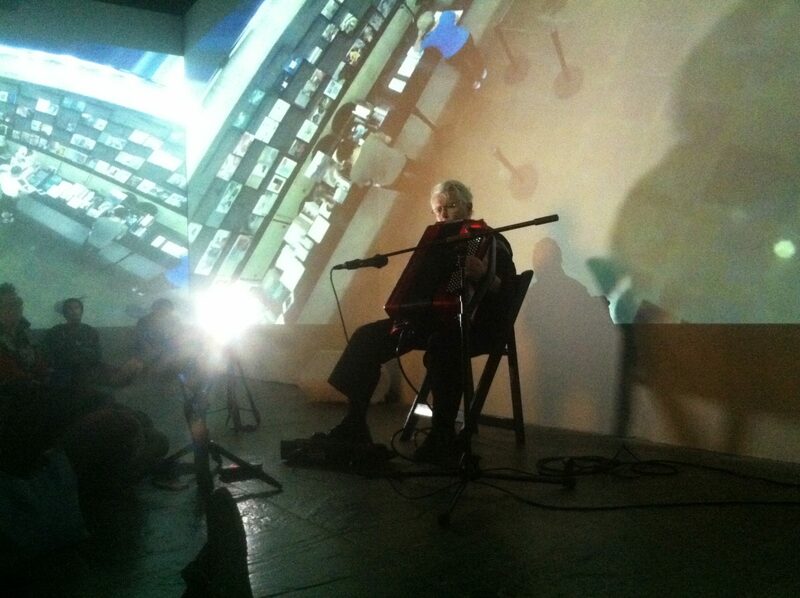 In addition to events and gatherings, such as those at Theater Yugen, Pauline, through her foundation, The Pauline Oliveros Foundation, established a Deep Listening listserv that connected this growing international network, via the internet. 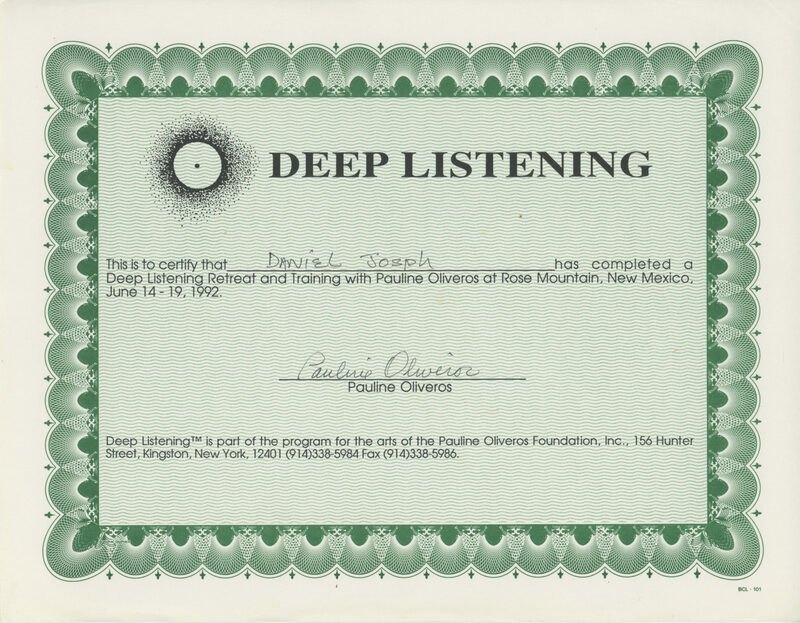 Referred to variously as the “DeepL” or “Deep Sub List,” the list, in addition to spreading the word about Pauline’s activities, hosted an incredibly varied, vibrant and sustained discussion, spawning many friendships. At some point, after leaving the Bay Area, I lost track of the list, but I continue to maintain relationships with a number of people that I first encountered there. Throughout these years, as the internet was emerging, Pauline led the way, always becoming an early adopter and expert user of each new tool and platform, and always responding to emails. Her forward looking approach to technology was a quality that I would continue to marvel at in the years that would follow. I eventually moved to New York in early 2001, returning to my east coast roots after ten years in California. Though my connection with Pauline was to that point confined to my life out west, it was no less significant upon my arrival in the City. I had no solid job offer or many contacts upon arrival, and Pauline helped connect me with a number of important people and organizations almost immediately. The first music place I visited – Pauline sent me – was Harvestworks, and a meeting with its Director Carol Parkinson, at 596 Broadway in SoHo. I had been aware of Harvestworks for some time, and had even recently applied for a residency. While there were no job openings or otherwise at that time, it was an exciting introduction to the Downtown music and arts community, and it would happen that, six years later, I would join the Harvestworks staff, and then a few more years later, become an Artist In Residence as well. All told, Harvestworks has been a crucial part of my life in New York, and I largely have Pauline to thank for that. But back to 2001. More contacts would flow from Pauline, and more meetings and new friendships would follow. Soon she would connect me with Thomas Buckner, a prominent baritone performer, record producer and concert presenter who was then searching for a new Coordinator for his highly regarded Interpretations series at Merkin Concert Hall. With considerable good fortune, I got the job, and suddenly found myself somewhat embedded in the center of New York City’s musical avant-garde. Over the course of the ensuing six years, I met countless musicians and composers, attended untold numbers of concerts, and launched my own musical career within a vibrant and inspiring community. Although the series would eventually be scaled back and I would lose my job, my relationship with Tom and his network would continue. Through his label, Mutable Music, I would eventually release two CDs, and in 2007 receive a commission to write a new work for Tom. All told, it was a wonderfully fortuitous connection that helped shaped the course of my new life in New York, and again, I owe much of it to Pauline. It was also significant that my first performance in New York following my move back east, was at Pauline’s Deep Listening Space in Kingston. At that time the Space was a fully functioning performance venue, recording studio, and the office of the Foundation. Performing as a soloist on the hammer dulcimer I had the pleasure of sharing a bill with electronic musician Carl Stone on May 2, 2002. It was wonderful spring evening and a great start to a new chapter in my life. 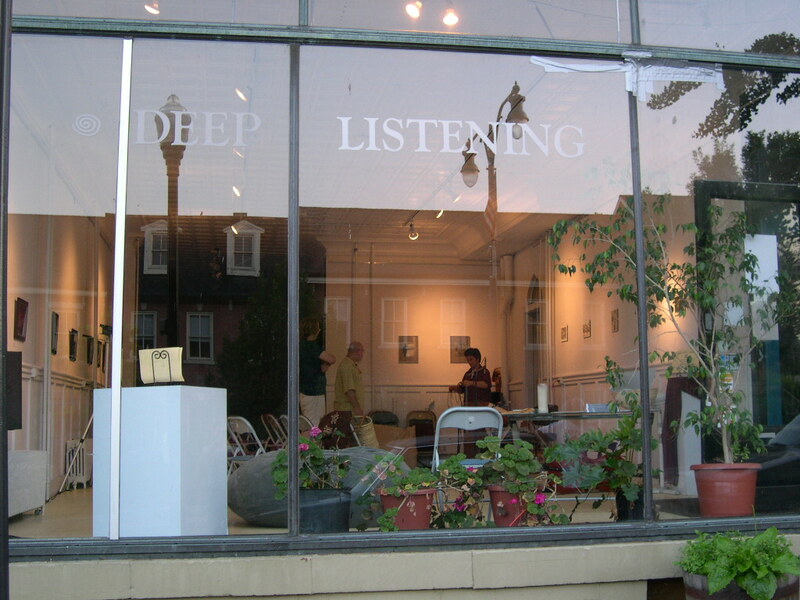 I performed two other times at the Deep Listening Space, one in collaboration with Loren Dempster, and the other in a trio with Miya Masaoka and JD Parran both in 2003 and always loved making the trip upstate. There would be other stories like this in the years that would follow, but what I am most grateful for is the many opportunities I had to see Pauline and hear her perform over the last 15 years of her life. Some of the highlights include Deep Listening Band performances at La MaMa (2004), Roulette (2008), and Bard College (2008), numerous accordion performance at The Stone (With Miya Masaoka, 2005, solo 2009, with Susie Ibarra and Ione 2010), her William Schuman award concert at Miller Theater (2010), an 80th birthday celebration concert at Issue Project Room (2012), a performance of her text pieces by Ghost Ensemble at Eyebeam (2013) on the occasion of the publication of her Anthology of Text Scores, a solo performance at Roulette (2014), a solo performance and installation at the Whitney Museum as part of of the 2014 Biennial, and those are some of the ones that immediately come to mind! Another memorable involving Pauline was a program I organized with Craig Shepard as part of the Music for Contemplation series. 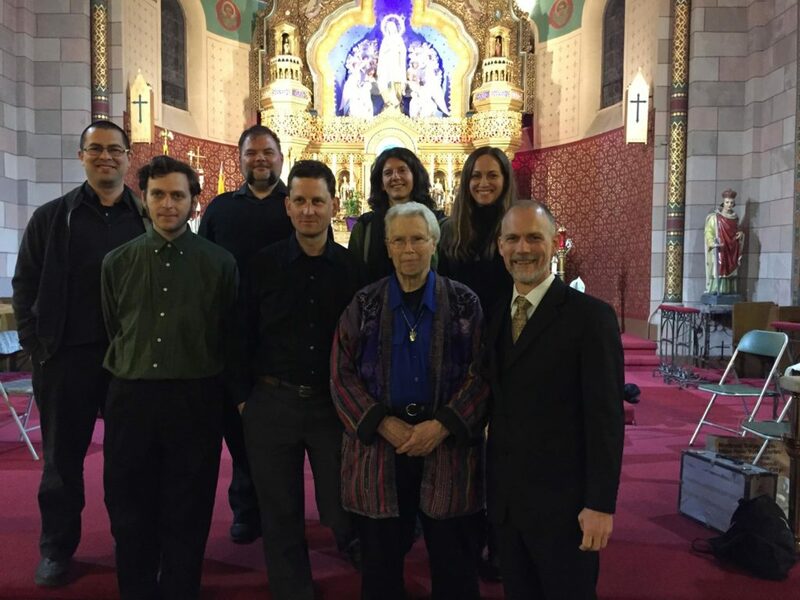 On May 2, 2015 a mixed ensemble of myself, Craig, Damon Loren Baker, Jen Baker, Shelley Burgon, Loren Dempster and Joshua Morris performed a program of her text scores at the Church of the Annunciation in Williamsburg, Brooklyn. The program included Earth Ears, In Consideration of the Earth and From Unknown Silences, and the church’s resonant acoustics provided the perfect space for our simple and spacious realizations. Pauline and Ione attended the concert, and seeing them out there in the audience sitting peacefully, with eyes closed, listening with all their attention remains one of my most cherished memories of Pauline. The last time I saw her was on October 18, 2016, a little over a month before she passed away. The occasion was a performance at National Sawdust, in Williamsburg, Brooklyn organized by the electroacoustic band The Blow, as part of their WOMANPRODUCER series. Following a pre-concert conversation between Pauline and the two members of The Blow, she performed a magical solo improvisation on her digital accordion. We spoke and exchanged hugs before the performance, and I remember being struck by the wonderful sparkly, silver baseball cap she wore. It seemed like an important gesture of celebration and playfulness. Ione and Gisela Gamper were also there, but oddly I didn’t know anyone else in the audience. I’m not sure there were many more New York performances by Pauline, if any, but suffice it to say that I am incredibly grateful that I was at that one. Apart from all these specific memories, I think what I will most remember about Pauline was her generous spirit, her sense of humor, and the seriousness and warmth with which she spoke. She was a great artist, a leader, a visionary and a sage, and she will be greatly missed. Post a comment — Trackback URI RSS 2.0 feed for these comments This entry (permalink) was posted on Tuesday, November 7, 2017, at 11:00 am by danjoseph. Filed in Appreciation and tagged deep listening, mills, new york, oliveros, pauline. Wonderful to read this. I have similar memories flowing from my first meeting Pauline in 1972. Yet another amazing aspect of her vital contribution to our world were/are the multitudinous connections she wove, many meeting, many residing in parallel universes. What a grand improvisation!